Arzruni’s three-week tour entitled “Keyboard Conversations” made its first stop in Gyumri on May 12. “I’ve performed benefit concerts in Yerevan before. The idea of holding benefit concerts sparked a year ago. 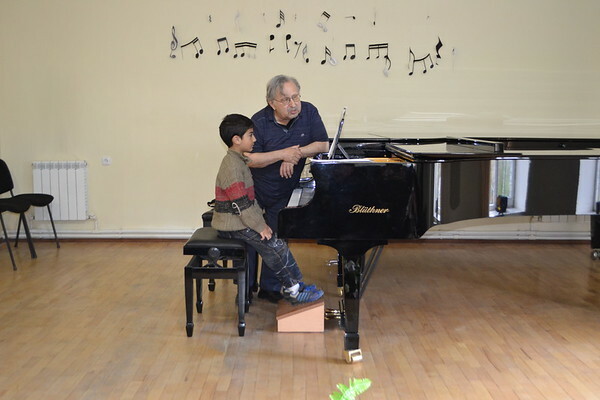 [This time,] I’ve concentrated on towns outside of Yerevan and will play and work with rural kids,” said Sahan Arzruni in a recent interview with local media declaring that his relationship with music and children had been longstanding. The benefit tour took place under the auspices of the Ministry of Culture of Armenia and Artsakh, and was organized by the Fund for Armenian Relief (FAR). Surrounded by an atmosphere of grace and appreciation, the great philanthropist’s music trilled up and down the piano, touching the heart of even the most demanding listeners. Arzruni’s passion for music comes from the creative environment in which he grew up. His aunt – the famous composer and pianist Sirvart Karamanuk – was the first to notice his talent and sent him to the local music school in his native Constantinople (Istanbul). At the age of 21, Sahan Arzruni moved to New York and studied at the Juilliard School. Sahan Arzruni has toured the world, but found that playing with young Armenian students to be a fascinating experience. Prior to each concert, the pianist held master classes for them and enjoyed working with them and interacting with them. He also included duets with young musicians in each concert to reach across generations. The tour repertoire included Komitas, Arno Babajanyan, Aram Khachatryan, Kara-Murza, Tigran Mansuryan, as well as Sahan Arzruni’s own compositions. Following each concert, the acclaimed musician was beseeched for an encore, and responded to the audience’s enthusiasm each time.